A CYC student plays with her new creation during Slime Club. Determined to do this, they reached out to CYC Arts and Innovation Coordinator Monica Wizgird to develop five lesson plans. They pitched their idea, got it approved, and created a supply list for all the materials they needed. Their goal was to teach the other kids how to make fluffy slime, fishbowl slime, butter slime, sponge slime, and cloud slime. To do this, the girls explored what it truly meant to be a teacher. The Slime Club leaders prep before a class. CYC staff lead classes. Cheeky said she enjoyed taking charge and helping the kids learn how to work on their projects. “I always see Ms. Monica do stuff like that during classes and encouraging me to do stuff like that,” said Cheeky, who wants to become a teacher or artist when she grows up. Monica said she was impressed by the creativity, tenacity, and professionalism of these four young women. 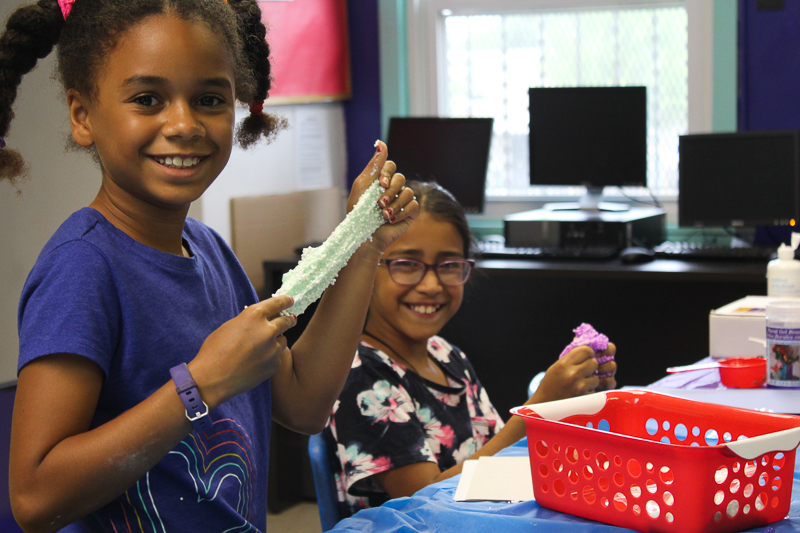 The girls also made sure to include the science behind how slime is created, such as the chemical reactions between borax and glue, in each of the lessons. “It’s not only about getting messy and having fun, it’s also about chemistry and making things,” Cheeky said. With the one-on-one time youth get with our staff members, CYC kids feel empowered to take charge of their education. This allows them to not only develop their leadership skills, but it sharpens their understanding of the topic at hand because of the ownership they take.